Here you will find information and guides to help you get the most out of Moodle, the course management software used at Trinity College. Among other things, faculty use Moodle to share resources (PDFs, links, e-books, and more) with students; for quizzes, discussion forums, and other assignments; and as a place to receive student work such as papers. This website was created in 2014 and is continually updated with new topics and information. You can always get Moodle help via your instructional technologist; plus feel free to stop by the Center for Educational Technology, located in LITC 105, to get help from one of our Student Technology Assistants. 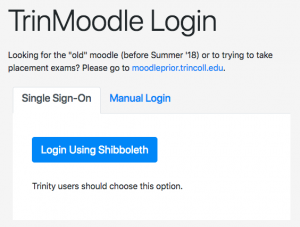 To bring up Moodle, enter http://moodle.trincoll.edu into your browser’s address bar. This will access the login screen as seen above. Click on ‘Login Using Shibboleth’ and then enter your Trinity College user credentials on the subsequent page to access the site. After your enter the site, you will see your home page with the courses available to you listed as hyperlinks. Click on a course link to access that course. At any time when working in Moodle, click on the blue question marks for help and explanations. Also, if you hover over an icon, it will display tool tips text briefly describing the functionality of that button. The Student Technology Assistants are located in the Center for Educational Technology, LITC 105.